Let’s face it, soon I can’t call my little a toddler anymore. He is gonna be a big. And then in REAL SCHOOL. AHHHHHHHHH! Well I am getting a glimpse into this with some of his counterparts going into preschool programs this fall where they have to pack lunches. I haven’t had to do this…thank you, daycare. I have also noticed people looking for ideas..and I haven’t done this! 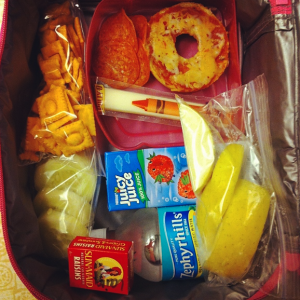 So then on instagram, I saw Stacey was posting her L’s school lunches she was packing. BRILLIANT! I asked her to come and guest post on her ideas. Back to our regularly scheduled progarm…take it away, Stacey! Enough is enough! That’s what I said after a PB&J rut that lasted at least three weeks. Yes, I shamefully admit that I sent my daughter with PB&J to school (aka: daycare) with the dud of sandwiches to the point she OD-ed on them. “No more peanut butter and jelly mommy.” BUT WHAT DO YOU WANT, KID? My three-year-old is picky in the way that she likes meat and cheese but she doesn’t like them on bread – unless it’s a sub. It hit me. As much as I don’t know what to send for the daughter’s lunch, how is she supposed to know of all the possibilities out there? 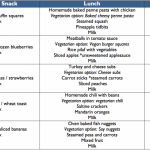 So like a good mommy does I turned to Pinterest and got great ideas but most of all my wheels got to turning and I’ve come up with some variations of school lunches on my own by brainstorming. Write what your child likes down. 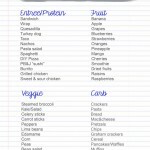 Just in prepping to write this blog I came across items that we haven’t used in a while and I’m excited to add to the grocery list to switch things up. Mix known foods with new foods. If your child likes carrots but you’re not sure he’ll eat green pepper, throw a few slices in with those orange sticks! Try new things at home before you send them to school. Follow up with your child’s teacher to see if he ate his lunch. We’ve been lucky in that we’ve simply told my daughter’s teacher we are trying new things and she is happy to report back to us. Make lunches the night before to save time in the morning but leave dry ingredients out of the fridge. Crackers and sandwiches get soft or soggy overnight in the fridge. Bananas and apples are also best to add in the morning. 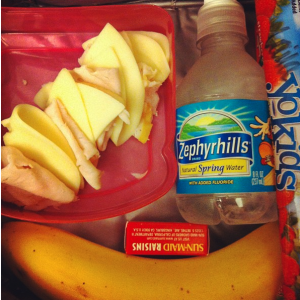 Ziplock, three-part bento box(ish). I love the bento boxes made for kids that I’ve found on Amazon but they run about $12 each and while they probably last a long time… I’m frugal, yo. In comes Ziplock’s version for a fraction of the cost and the set up reminds your child of the lunchables his classmates may covet. 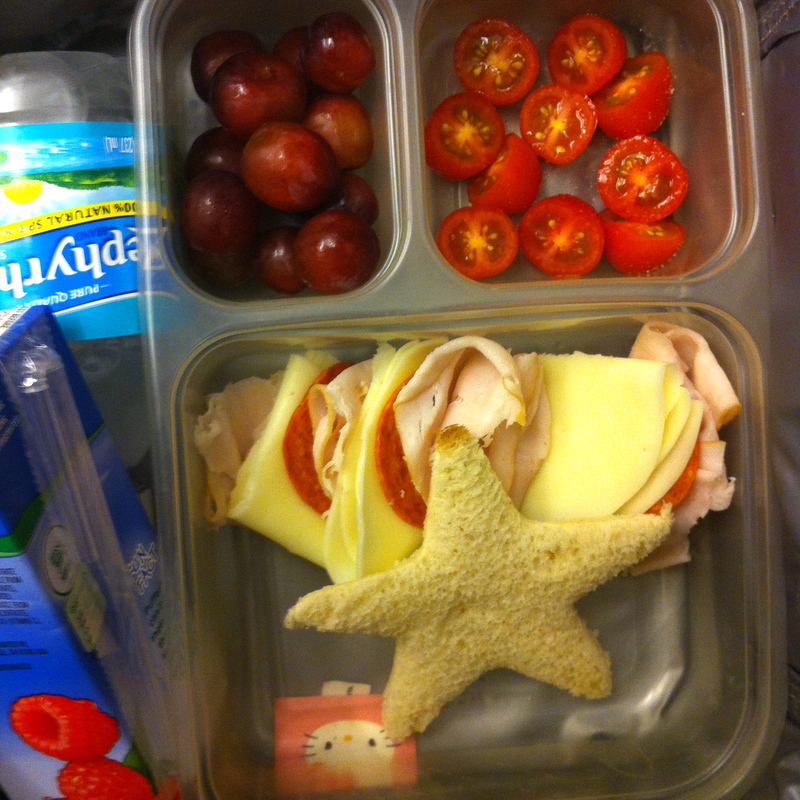 Ziplock bento with turkey, pepperoni, provolone skewer, bread cut into a star, cherry tomatoes sprinkled with salt, and grapes. 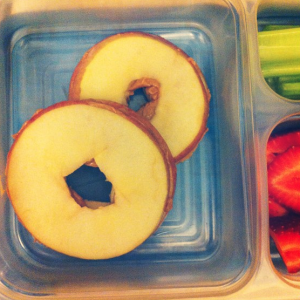 Reusable sandwich boxes. I use these for sandwiches as well as containers to hold whatever other “main dish” I serve in little one’s lunch. Warning: I do not recommend reusable sandwich pouches – too many crevices you have to worry about cleaning and they don’t hold up so well in the dishwasher (and always come out wet and have to be propped up to dry – yeeesh!). Rubbermaid little cubes, or off brand character containers. These can be used to store fruit and veggies and are reusable. Snack-size Ziplock bags. Not so eco-friendly but I usually stash her cracker snacks (goldfish, chez-its, etc) in them because a lot of Tupperware can be challenging to fit into the lunchbox all at once. Cookie cutters. When we do make sandwiches for lunch it’s always fun to cut them into a fun shape. 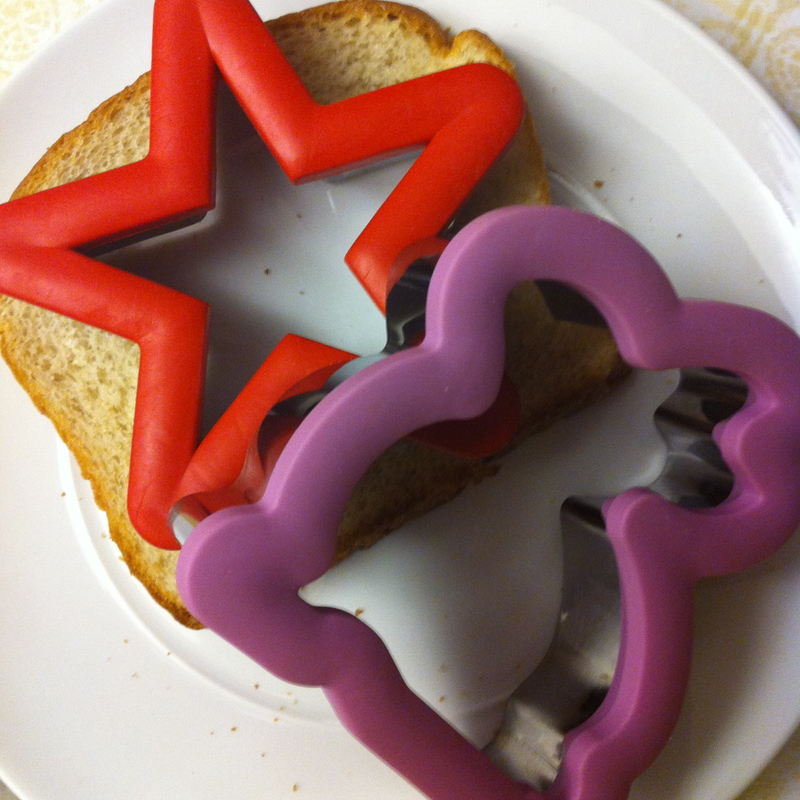 I recommend the cookie cutters with the rubber grip. They stand up in the dishwasher without showing much wear and are hardier in general. Fails: Apple PB sandwiches – they get soggy even if made the morning of. All white meat chicken nuggets – I’m assuming my kid doesn’t like them not heated up. Apple PB sandwiches, best to serve fresh at home. Pizza bagel: mini bagel + pizza sauce + pepperoni + shredded cheese. We’ve only just begun, folks! This is merely a couple weeks into my brainstorming. I don’t want to overwhelm the tot so we’re introducing new things here and there. I have to tell you, there is really something to be said about writing out what you’ve used in the past. Taking pictures helps as well. I scrolled through my phone looking for things I could add to the post and got reminded of more than a few items we haven’t used in a while. I’m going to try to start keeping track of my daughter’s school lunches on instagram using #schoollunch and I invite you to play along. Let’s see how we can inspire each other. 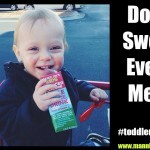 *You can follow me on instagram @mrsellemennop and don’t forget to log #toddlerdinners along with @mannlymama and other amazing moms. I love these ideas! 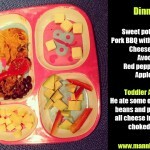 My son is only 3 but anything that gets me thinking creatively about food is a win in my book. Can I lobby for bentos???? We have the PBK bentos, $12 each. We have used them 5 days a week for an entire year (my boys are in year round school then they go to camps where we pack lunches) and they are still going strong. To us, it preferable than all those little bags to open and throw away from the last photo. 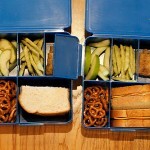 Bentos keep the food separate, dry, and no waste. PS. Brandy I would love to do a no waste lunch post sometime! Eat at a school some time and you will be horrified at the mountain of trash that is generated each day. 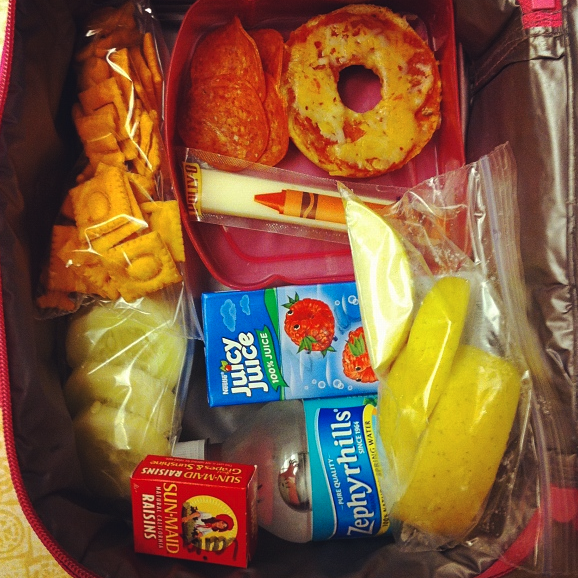 To answer about the amount of food I send: I have to pack a morning snack and an afternoon snack along with her lunch. I probably send more than I need to at times but I rather her have more than enough than not enough. 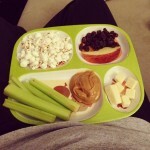 My daughter usually eats like a bird but there are times she busts out with a growth spurt and requires more fuel. We are sending her to a new daycare in a few weeks that only requires a packed lunch and I am looking forward to being less wasteful. Thanks for reinforcing the bento box usage. I hope to invest in some eventually.